Looking to start or change your career? You’ll find that and so much more at Cayman Career Academy. 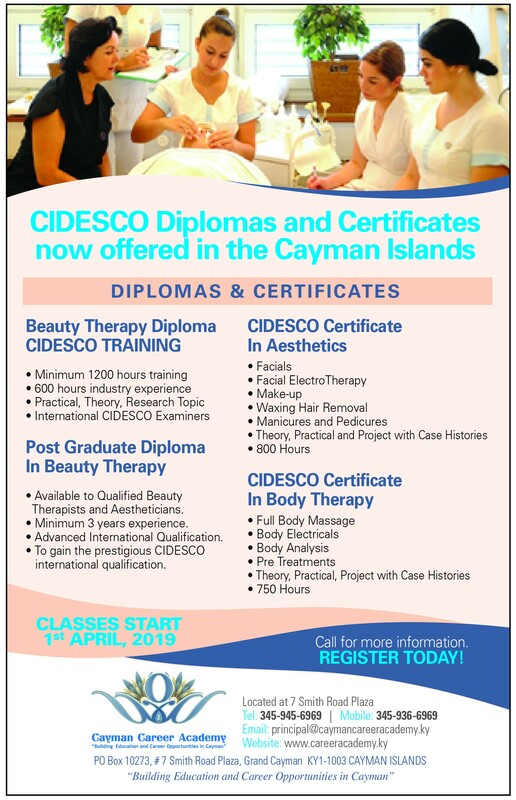 Be a part of history , enroll as the first set of CIDESCO students in the Cayman Islands and the Caribbean, students learn the best tips, tools, and techniques, while studying in real-life scenarios at Cayman Career Academy and earning the CIDESCO diploma. What is the CIDESCO diploma? The CIDESCO diploma is the world’s most prestigious diploma in the world for Aesthetics and Beauty Therapy. Students can pursue educational training in facial beauty treatments, electrical therapy facial and body treatments and massage therapies, make up application, Nail therapy, and other subjects in the field. Developed by an international education committee of leading professionals, CIDESCO courses help students who desire a career in this area gain real-world knowledge. CIDESCO students are highly sought from employers around the world based on the knowledge and experience gained while in their program of study. What services can students expect to learn at Cayman Career Academy? Students of Cayman Career Academy can expect to learn a number of specialties that are a large part of the Cayman Islands careers focus. They will work with the supervision of lecturers with clients on waxing services massage treatments, facials & electrical specialty treatments, professional makeup application, pedicure and manicure packages, spa business marketing and Front desk operations and so much more. Students receive world class instruction while enhancing their skills to offer the best services in the Cayman Islands. Once completed with their courses, students are able to work anywhere in the world as an aesthetics and beauty professional. Students can expect to excel and start their chosen careers in as little as under a year. To take a tour of the facility and get more information on the program and its offerings, contact a counselor or student advisor at the Cayman Career Academy today. Students who wish to further their career will have a world of realization with the Cayman Career Academy in George Town, Cayman Islands. Take the chance and open the doors to your future today. Call 345-945-6969 or 345-936-6969 and begin your new career! CIDESCO… the world standard for Beauty & Spa Therapy!